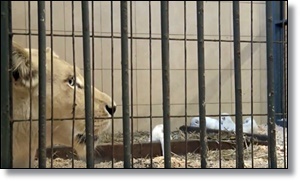 Borysew, Poland - Four rare white lion cubs have been born in a private zoo in central Poland. The lion cubs were born on Sunday at the Zoo Safari in Borysew and are doing well under the care of their mother, 5-year-old Azira. They are the fourth litter for Azira and 7-year-old Sahim. There are at most only a few hundred white lions in the world. Head of the zoo Andrzej Pabich said the genders of the cubs was unknown because keepers have not touched them yet. On Thursday, a white tiger also gave birth at the zoo, and Pabich believes there are three cubs.